RunCore presents their new SandForce-based 7mm Pro V Ultra SSD, a thin storage device designed for ultrabooks. The disk promises read speeds of up to 560MB/s, write speeds as high as 525MB/s, and random 4KB write performance of 60,000 IOPS. It will be available in 60GB, 120GB, 240GB and 480GB capacities, pricing is unknown. RunCore, a leading supplier of high-performance solid-state drives, has made their move and announced global availability of their Ultrabook SSD solutions, with their Sandforce-based 7mm Pro V Ultra SSD SATA III series Ultrabooks and other mobile applications on market. With only 7mm thickness this series is built to unleash the performance potential of the SATA 6Gbps interface, offering up to 525MB/s read and 525MB/s write, featuring an extreme write IOPS up to 75000, even in smallest devices of the next and upcoming generations. 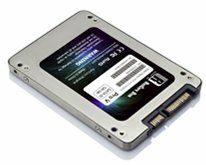 Key attributes include ultra-high performance, low power consumption, all combined with increased system responsiveness, high reliability, and enhanced ruggedness when compared to conventional opto-mechanical SATA hard drives. It easily integrates into today’s mobile and desktop platforms and features TRIM support to optimize performance over the drive’s lifespan as the ultimate Windows 7 companion. The brushed stainless steel enclosure not only adds to the aesthetical appearance but also adds to its ruggedness.